with dbell, you’re always connected to your home. 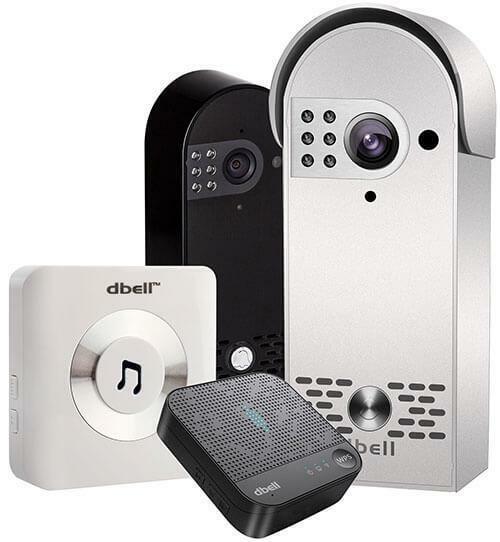 dbell is not just a typical video doorbell. We all know home security starts from the door. dbell is your sentry at the door. Compare us with the rest of the competitive doorbell. If you are not happy with what we have to offer, we salute your judgement and thank you for giving us a chance. dbell featured on the Home and Condo Guide. Free shipping on regular priced products within Canada. International shipping charges apply. No Hassle Return. Just email us for the return authorization. dbell will accept returns within 30 days from the date of receipt. Designed and engineered in Canada. No contracts to sign. There are No monthly fees. Once you have your dbell, you are all set. Satisfaction guaranteed. If you are not satisfied, return within 30 days to get your refund. Conditions apply. dbell is affordable. Try dbell and any other competitive doorbell. If you are not 100% satisfied with dbell, contact us for the refund and your free gift. Say HELLO to the smartest doorbell you’ll ever own. The new digital video doorbell by dbell answers the age old question, “Who’s there?” in a whole new way. Equipped with a camera, microphone, speaker, motion sensor, night vision and wired or wireless networking, there’s not a lot this doorbell can’t do, no matter where you happen to be. Security was uppermost in Harriett’s mind when she chose the dbell. Her California neighborhood had been suffering a series of break-ins, and people were becoming concerned about their safety. After opening her door late one night to a stranger, without even thinking, she decided it was time to bolster her security. Sitting on a warm, sunny beach in Florida, Innkeeper Jane Dominie doesn’t worry if someone shows up at the front door of her Moonlight Beach Suites in Nova Scotia, Canada, looking for a room. Her doorbell rings on her smartphone, and with the tap of an icon, she is face to face with her visitor so many miles to her north. Not only can she see them, she can talk to them, too, and they to her. dbell Wi-Fi smart video doorbell provides comfort and incredible convenience for everyone – Home and Business Owner and Visitors. Granting Security1 at your doorsteps and freedom at your fingertips! Receive an alert when the kids get home or the cleaning crew has arrived. Be safe knowing who is on the other side before opening the door.